The PlayStation 4 launched in November and so far has sold and performed well for Sony. One thing it doesn’t have, though, is backwards compatibility. The PS3 was out for seven years before that, and the PlayStation 2 before it sold over 150 million units worldwide. That’s a lot of old video games that don’t run on your shiny new system. Sony bought cloud-based streaming-gaming provider Gaikai in 2012, and announced in 2013 that they would use the streaming service to bring PS3 games to the PS4 and handheld PS Vita. Today at CES, Sony execs announced that the service is called PlayStation Now, and it appears to be even bigger than players might have guessed. 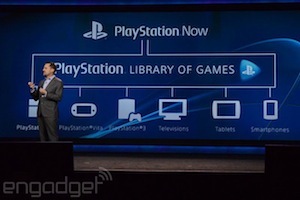 Not only will PlayStation Now serve up PS2 and PS3 games to the new current generation of consoles, but also it will stream titles to the PS3, tablets, smartphones, and even to smart TVs (like the Sony Bravia, naturally) directly. The cloud-based gaming service can work on such a wide range of devices the same way an HD streaming movie from Netflix or YouTube can. The computing and graphics processing happen remotely on big servers. You’re essentially seeing a video of what you’re doing, with your controller signals being sent back to the server, and a stream of what you did being sent back to you. The end result, when it works, feels like just sitting there playing a video game. Successful play doesn’t require a high-end graphics card on the player’s end… but it does need a stable, low-latency internet connection. Sony is running a live demo of PlayStation now at CES, using 2013 hit (and top-end HD graphical spectacle) The Last of Us. According to Polygon, PlayStation Now will allow users both to rent access to individual games, and also to pay for subscription plans. Sony hasn’t yet clarified exactly how either option will work, or how much it will cost. Sony says they plan to launch a closed beta of the service by the end of this month, and that they hope to roll out PlayStation Now over the summer.